CEREC Chairside Solutions. One visit dentistry. Ask Dr. James Nguyen or Dr. Kim N. Nguyen how easy and time effective it is to have a same day inlay, onlay, or crown restoration completed all in one visit and without any hassles. It's that easy and in a couple of hours you can walk out with a natural, beautiful looking crown. 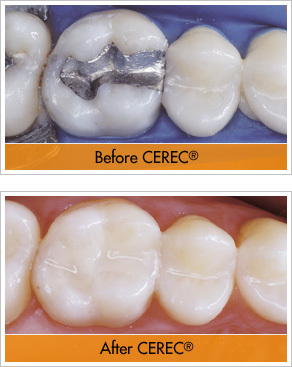 Large metal (amalgam) fillings replaced with CEREC fillings/crowns. Technology that continues to improve to provide the best dental care for our patients.